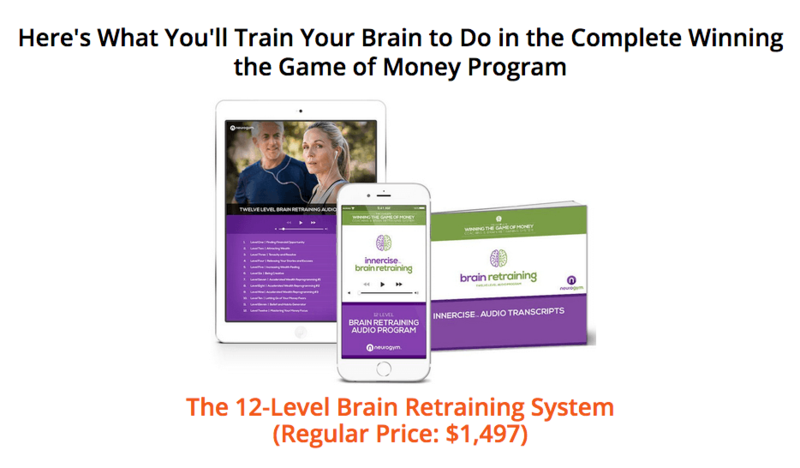 Rewire and retrain your brain to embrace empowering new attitudes, beliefs and habits around money so you can have the income and the lifestyle you deserve. Release your brain’s old thought patterns and habits, like procrastination and poor organization, that limit you financially and replace them with ones that will help you achieve a greater and greater abundance — with less struggle. 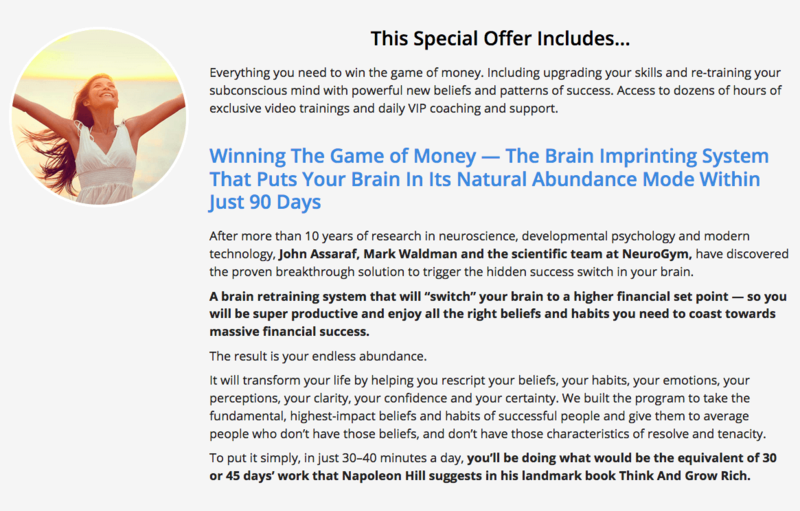 Be part of a private online VIP coaching group where you will learn with John Assaraf and Mark Waldman and over 17,000 Complete Winning the Game of Money Coaching and Brain Retraining System members who will encourage, support and nurture you to shatter the glass ceiling of your income… every single day. Program your brain to filter out the inner C.R.A.P. (Conflicts, Resistance, Anxiety and Problems) that are holding you back from your happiness and success. Imprint upon your brain your deepest “why,” and allow yourself to be inspired to create a big impact in the world, so you can fulfill your highest potential. Level 01 – Finding Financial OpportunityIn this level, you will begin to increase your level of awareness of financial opportunities all around you and it will prime your brain with the beliefs required to achieve financial abundance or success.Level 02 – Attracting WealthThe focus of this level is to raise your internal set point and bring your consciousness into alignment to attract greater levels of prosperity, abundance and wealth. You will increase awareness around your money story, along with any deeply rooted beliefs and perceptions you have held, while reinforcing the positive beliefs from Level 1.Level 03 – Tenacity & ResolveIn this level, you will retrain your brain to strengthen your inner resolve, persistence and tenacity, so you can produce greater financial results.Level 04 – Releasing Your Stories & ExcusesIn this level, you will learn how the unproductive or destructive self-image and money stories you tell yourself repeatedly keep you stuck in a cycle of achieving the same undesired outcomes over and over again. It is time to stop this pattern now and release them once and for all. Emotion drives behavior. This level will train you to think and feel wealthy, so you automatically resonate with earning more money. Experience firsthand what it feels like to be wealthy, as it becomes grounded in your body and emotions — and start to increase those feelings now. By the time most people are in their 30s, the majority of their creative neurons are no longer being used. 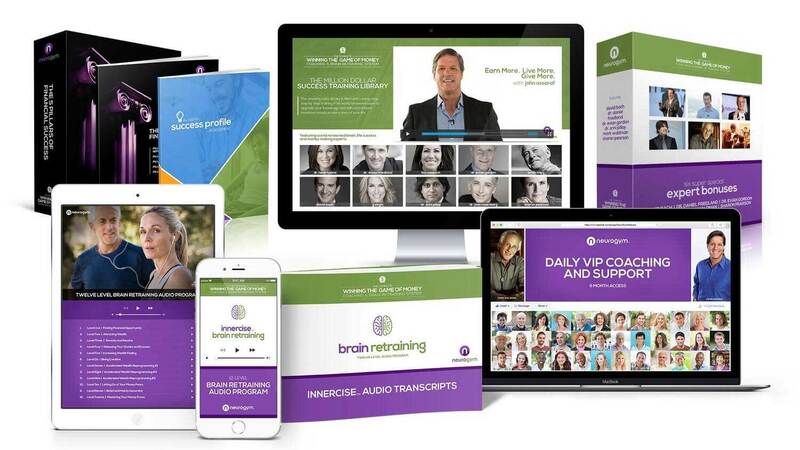 The daily audio will support you to reactivate your creative neurons using your imagination and higher intuitive function, so you can bring creativity into the ways that you earn money and help you generate more imaginative ideas than ever before. This advanced level uses the “overload principle” to creatively bombard your conscious and nonconscious mind for maximum neural pattern creation, incorporating a combination of each of the previous levels’ methodologies and content. In this advanced level, we use the “overload principle” to go deeper and reinforce your conscious and unconscious mind’s positive neural pattern to create the required mental pathways for attracting wealth. Hold onto your cerebral cortex as the gamma frequencies in this level cement the most powerful Accelerated Wealth Reprogramming content in the world. This will give you the ultimate in clarity, focus and laser-precise abilities to accomplish your financial and life goals. Get ready to let go and release any of your fears, worries, anxieties, or stress around money in this level by training your brain to trust your intuition. Now that you have cleared out old programming and primed your brain with new empowering patterns, it’s time to adopt updated, productive beliefs and behaviors that support abundance. In this advanced level, you will learn a simple method to consciously create, impress and install the beliefs and habits of your choice. With a little practice and imagination, you can actually choose what you believe. In this level, you will reinforce your ability to choose a financial target and follow through to its achievement. From this point on, you can start to tell yourself a brand-new story about money, with consistent, successful results.